With 2017 already a quarter of the way over, has your organization started planning for 2018 yet? Strong organizations—especially ones that use an ever-evolving technology such as GIS—continually plan for future developments and updates to their current product offerings. Furthermore, strategic planning like this is essential to making sure a GIS department has a single vision, where products and innovation come together to produce a sustainable future. Developing a GIS-specific strategic plan ensures that departmental and corporate leadership are on the same page when it comes to identifying how GIS empowers internal staff, as well as clients and external stakeholders. When making a strategic plan for GIS, staff skills, other technologies, and internal and external processes and communication all need to be taken into consideration so they can be optimized. But current resources and staff skill levels shouldn’t restrict a strategy. Instead, improvements and desired outcomes should be built directly into the strategic plan. This demonstrates to senior leadership how the department will accomplish its goals. Below is a step-by-step guide to developing a GIS-specific strategic plan, based on lessons learned recently at Connected Nation, an organization that helps communities and states plan broadband service. The first step to preparing a GIS strategic plan is to conduct a self-assessment. Ask questions such as, Where are we now? Where do we want to be? and What resources are going to help us get there? The purpose is to acknowledge weaknesses in the GIS department and around the organization and turn them into opportunities. A great resource that can serve as a guide for performing self-assessments is the GIS Capability Maturity Model from the Urban and Regional Information Systems Association’s (URISA) GIS Management Institute. This evaluation tool can help organizations identify areas of improvement in enterprise GIS management and implement changes to make their work more effective and gain better returns on investment. After completing the self-assessment, look for ideas about how to innovate, make enhancements to current product offerings, and become more efficient with GIS. 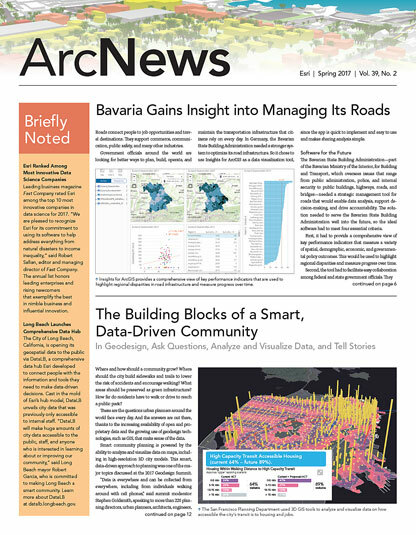 Seeking out and reading articles, case studies, and professional newsletters about GIS is an excellent way to discover how others have tackled similar issues. How have other organizations transformed comparable challenges into solutions? Which solution trends are appearing in print more frequently, and how could they alleviate specific pain points? All organizations—whether they are nonprofits, government agencies, or private firms—have an overarching foundation that connects what they do with how they do it and, most importantly, why they do it. Figure out why your organization exists and incorporate that mission into the GIS strategic plan. This is an effective way to ensure that, as the GIS department plans for innovation and sustainability, there’s collaboration across the organization—at the corporate, departmental, and individual levels—to establish meaningful goals and objectives. If an organization doesn’t currently have a visible, deliberate vision that is widely understood by all staff, however, then the GIS strategic planning exercise can serve as a motivator to senior leadership to establish one. Setting goals at multiple levels within the organization increases accountability and lets each staff member know how his or her contributions fit into a project, program, or core competency. It also provides an opportunity to address individual skill gaps and resource needs while contributing to overarching departmental and corporate objectives. Set an individual goal to increase training in a specific area. Set a departmental goal to migrate or upgrade an essential system or process. Set a corporate goal to release a new product that helps stakeholders make more informed decisions. What motivates the organization’s work? Why do stakeholders seek out the organization’s products and expertise? Which processes and products align with the organization’s vision? Do planned innovations on the GIS team fit the organization’s present and future strategies? Do staff outside the GIS department know everything that the team does and is capable of doing? Which products do non-GIS staff and their clients or stakeholders use most? How do staff members throughout the organization use GIS products? What tools and functionality do non-GIS staff wish their GIS products had? What frustrates non-GIS staff when they use current products? What questions are people trying to answer when using GIS tools? Pending initial feedback, it is also beneficial to have technical meetings with select clients and stakeholders who frequently use the GIS department’s products. It is ideal to keep the number of meeting attendees small, but do include project managers and main points of contact, in addition to one or two GIS staff members who work on a project that these stakeholders are involved in. This gives the stakeholders and internal staff an opportunity to feel more connected to the strategic plan and have a vested interest in its success. Once the strategic plan is created, don’t just print it out and let it sit on a shelf in the office. It should be treated as a living document—one that the GIS department revisits often to ensure that its goals are still attainable and relevant. Consider it a road map that provides short- and long-term objectives, forecasts the resources that will be needed, and improves accountability with the department. Consistently revisiting and updating the plan also shows senior leadership that the continuous evolution of GIS—by frequently improving and enhancing GIS products—is vital to the organization’s success. This allows the GIS team to identify current and potential risks and mitigate them before they become impediments to the organization’s success. Devising GIS innovations through strategic planning doesn’t have to be a long, drawn-out process each time. Once the GIS manager establishes a cycle of research, planning, and feedback, the GIS department will be able to effectively collaborate with everyone in the organization to ensure that the products and processes put in place directly contribute to the overarching vision and empower as many people—internally and externally—as possible. Ashley Hitt, GISP, is the director of GIS services for Connected Nation, a national leader in broadband expansion programs. She uses GIS to develop strategies for providing data visualization solutions that impact broadband Internet policy, economic development, and the digital divide. Hitt is a recent URISA board member (2013–2016) and was selected as URISA’s Young GIS Professional of the Year in 2011.